In order for your home to look its best this summer, it is essential that your lawn look its best as well. After all, the lawn is the first thing people see, and provides the passerby the first glimpse of your home. Yet in the same vein, keeping a pristine lawn can be difficult this time of year, with the scorching hot sun burning your grass and the lack of sufficient rainfall to keep your grass green. 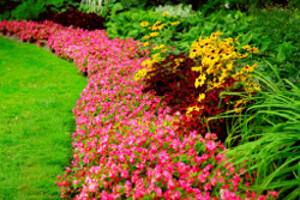 Our Fort Worth TX landscapers at Blooms Landcare can provide your lawn with seasonal color installation, ensuring a beautiful landscape all summer long. With our seasonal color installation, we can transform your boring backyard into a work of art. Our experts can develop a plan for the current season that best suits your property, and can work in any outdoor area, be it the front yard or the back porch. Our expert team consists of staff arborists with horticulture degrees, so you know your lawn is in the best hands possible. And with a wide variety of colors and styles available to suit every need, we aim to please even the most discerning decorator. With Blooms Landcare, you can be guaranteed first-class landscaping installation using the highest quality products and materials. Our custom designing makes the experience completely personal, and we can truly make your vision for your lawn become a reality. Using the most up-to-date technology, we can complete your landscaping redesign in a timely and efficient manner. With any comments, questions, or to schedule a seasonal color installation today, give us a call at (817) 688-5352 or visit us online today.